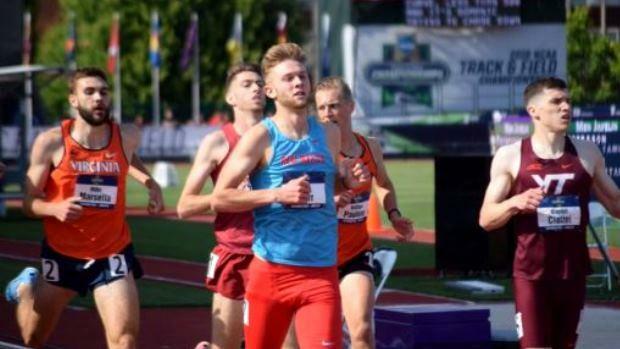 Former Chariho all-stater Mike Marsella advanced to the finals of the 1,500-meter run on Wednesday at the NCAA Division 1 Outdoor Track and Field Championships at historic Hayward Field in Oregon. Marsella, a graduate student at Virginia, earned his berth by finishing seventh overall in a very competitive heat with a time of 3 minutes, 48.01 seconds. The heat was won by Josh Kerr of New Mexico, who clocked the fastest time of the day in 3:47.47. Marsella will join the 12 qualifiers for the finals on Friday at 5:42 p.m. EST. Also on Wednesday, Adam Kelly, a national champion weight-thrower while at Barrington and a junior at Princeton, placed ninth overall in the finals of the hammer throw with a heave of 230 feet, 6 inches.